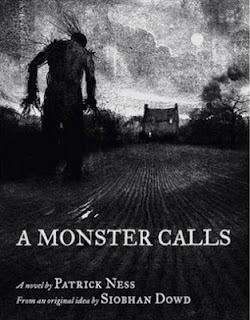 If you haven’t read this book then this is probably just another cool quote you’ve read, however if you have had the pleasure of reading A Monster Calls by Patrick Ness, a story inspired by Siobhan Dowd, then it means so much more. Patrick Ness wrote this story after the early death of Siobhan Dowd who had the original idea and that Ness completed after she passed. The story is about a 13 year old boy named Conor whose mother is dying of an unspecified illness that is most likely a type of cancer. He is having recurring nightmares and then comes a living one (in addition to the one where his mother is dying) in the form of a yew tree turned monster man. This yew tree turned monster man visits Conor most every night and states that his purpose is to tell Conor stories that make no sense to him because in these stories the “good guy” always seemed slighted in the end. In between these visits his mother is getting sicker, the bullies at school continue to pick on him, and he is forced to face the possibility of living with his grandmother whom he cannot stand. *SPOILER ALERT AHEAD*All of the pressure to maintain his sanity in the midst of all this chaos is wearing on Conor and he begins to crack every so slowly until a final culmination where Conor ends up beating the absolute hell out of the kid who has been bullying him. Forgive my former bullied self because as a 25 year old grown woman I was rooting for this scene from the beginning but I digress. The monster’s MO in all of this is to get Conor to tell the truth aka speak about his recurring nightmare and what it all means, he refuses so he inevitably is forced to live out his nightmare during waking hours until he tells the truth about what he is feeling. *Whew* It is exhausting as it sounds, this poor child. I will not reveal what that is because if you have not read the book, please do, it is amazing. I have had the luxury of never having to lose a parent but the thought of losing my mother or father at the age of 25 is devastating so to read about Conor losing his mother at a mere 13 years is beyond heart breaking…which my heart did do while reading this…it broke. Having never experienced this kind of loss I still was able to feel exactly what Conor was feeling throughout the book and that can only be attributed to Ness’s fantastic writing quality. The emotions that each individual could imagine feeling in the midst of this same situation are exactly what Conor goes through. He is sad, angry, no excuse me PISSED, yet he tries to hold it all together and hope beyond hope that his mother will get better. We would all do the same in similar situations. I cannot get over how well this was written because the pathos of the entire book was just perfect. If I am ever in the unfortunate position of losing a loved one this close I would read this book again and furthermore, any child or young adult or even adult that is going through the loss of someone they love should read this. It would help clarify grief and loss to any young person having to go through something as horrible as this.